Once or twice a week, I get on Instagram Stories to share a beauty product while I’m getting ready in the morning for work. Without fail, every time I start my story I say: “I’m running late for work, but I wanted to show you this product real quick.” It seems like no matter how much sleep I get or how early I get up, I’m still always running late. I really think it’s been harder since I made the transition back to full-time work – instead of going to work for a couple hours, I now need to make sure I’ve got everything planned and ready for a whole day of work. Since this is the #yearofme and I’ve got big goals that I want to achieve, I’m learning that I really need some systems in place to prevent me from wasting valuable time. I’m also tired of racing to work every morning and feeling like I’m starting my day like such a hot mess. 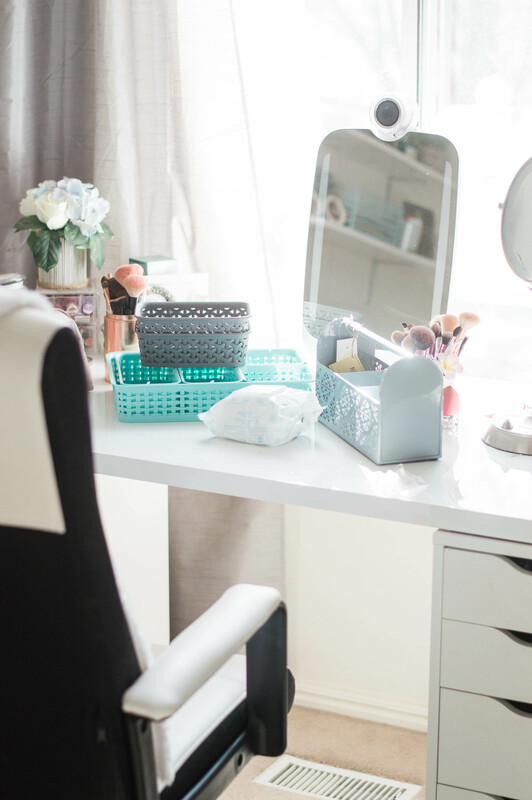 I had to take a hard look at where I was losing time in the morning so I could come up with a plan of attack and surprise, surprise, this beauty blogger was spending WAY too much time in front of her vanity putting her makeup on (and Instagramming it.) 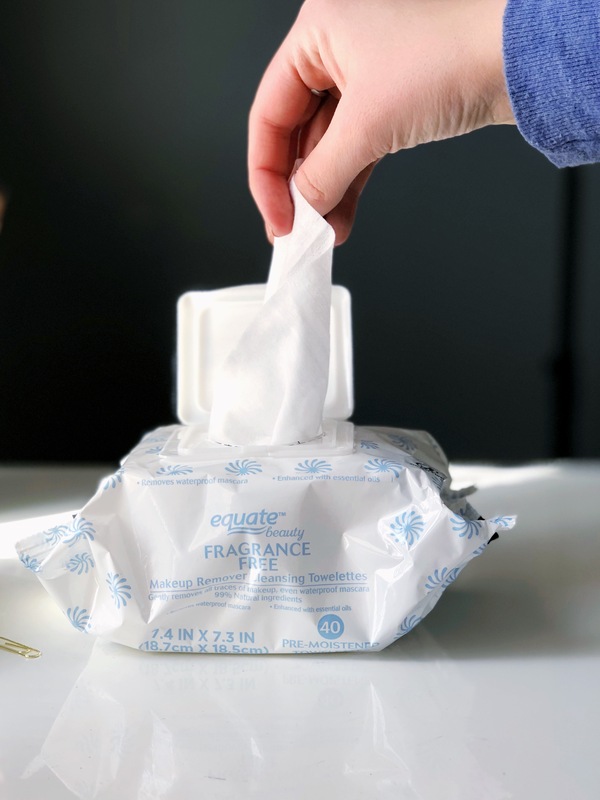 After getting my hands on the Equate Fragrance-Free Makeup Remover Towelettes on my last Walmart run, I was inspired to make some changes to my morning beauty routine. I knew I needed to simplify and organize my beauty routine so I could get out of the door faster in the mornings. On the other hand, doing my makeup is important to me (it’s my way of being creative and spending some time loving myself) so I didn’t want to cut it out altogether. Plus, I’m the first face everybody sees’s when they walk into my office, so it’s important to me to look polished and put together and not like I rolled out of bed two minutes ago. 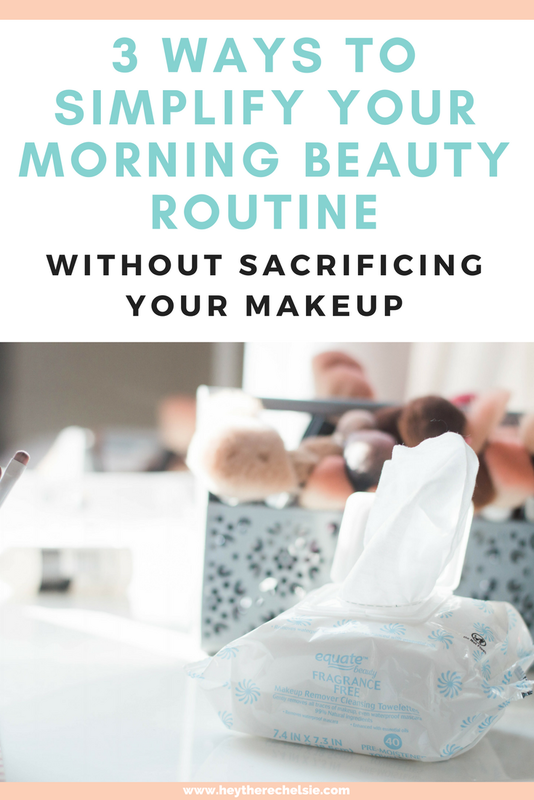 Don’t get me wrong, there are days where I am lucky if I walk out of the door with pants and mascara on, but structuring my morning so that I have time to put my makeup on is on the top of my priority list. Since I’m not the only busy lady in the world, I wanted to share some of the things I’ve done recently to simplify my morning beauty routine. 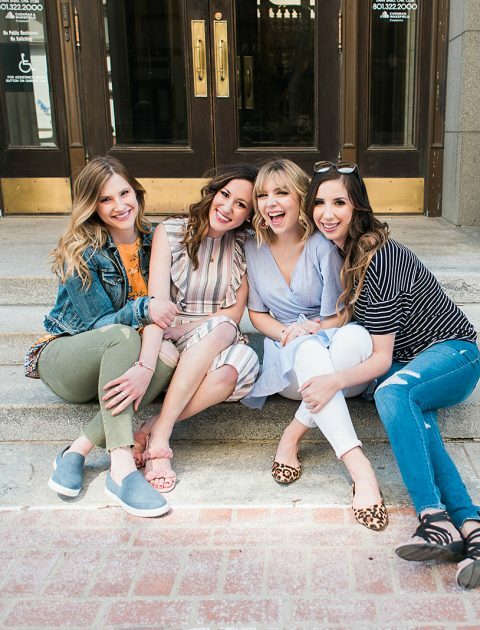 Whether you’re a mom or a college student or working a full-time 9-5, I hope this gives you busy ladies a few ideas on how to reduce stress when running on a tight schedule while also giving yourself time to put your makeup on so you can feel ready to put your best foot forward and conquer your day. If you haven’t been using makeup removing wipes, you probably are living under a rock. Just kidding, but really, I’m convinced that these things are the best thing to happen since sliced bread. 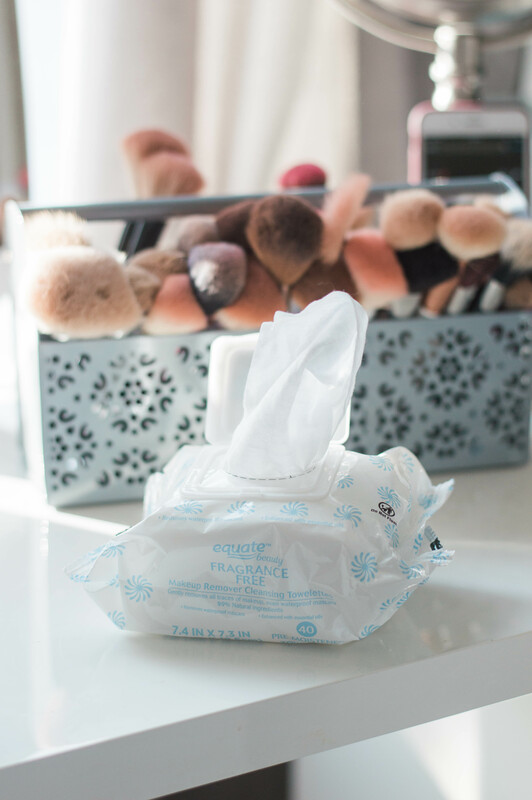 I’ve tested out many MANY kinds of makeup remover wipes, but the Equate Fragrance-Free Makeup Remover Towelettes are HANDS DOWN the best. 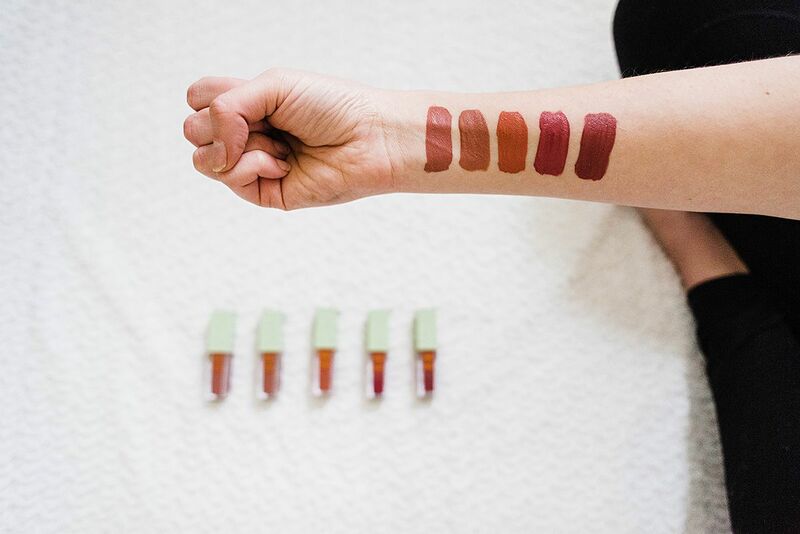 They are so, so, so gentle on the skin (because of no fragrance, duh!) and they are gentle on the wallet and they are easy to find and purchase (located in the cosmetic’s aisle of Walmart!) I am NEVER without these close by – I seriously keep a pack of these in my nightstand, in my bathroom, and in my vanity. In the morning, I use these to wipe off any last traces of mascara or liner that I wasn’t able to get off the night before. It’s easy, quick, and simple, and it doesn’t irritate my eyes and it’s MUCH faster than scrubbing at my face with makeup remover and a washcloth over a sink. I also use these to clean up my eye-shadow after I apply it. I always get messy when I’m in a rush and tend to blow out my “natural” eyeshadow look into a super smokey eye. I use these towelettes to clean up my eyeshadow by gently dragging one from the outside corner of my eye towards the tail of my eyebrow. This gives me a clean eyeshadow shape and it prevents me from going back to the sink to clean up my eyeshadow with a q-tip and makeup remover. Another reason to keep the Equate Towelettes on-hand? They are super versatile! Splatter my foundation on my vanity? No problem, my Equate Makeup Wipe can clean it. Have a super dirty makeup brush that I need to use for my bronzer? No problem, I can use my Equate Towelette to remove old makeup (just make sure it dries before dipping it into your product.) Got major fall out from the glitter eye-shadow you are trying to apply? Equate Makeup Towelette to the rescue. THESE THINGS ARE BULLET-PROOF! 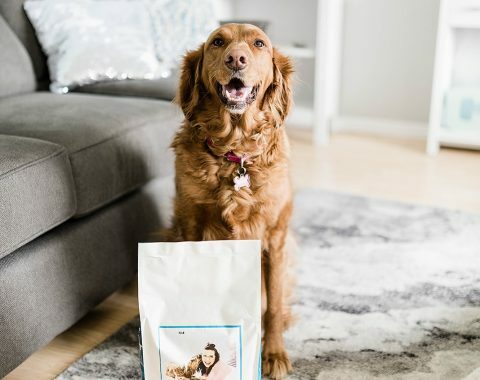 And, like I mentioned before, they are super gentle on the skin and are made with essential oils and 99% natural ingredients, so you really can’t go wrong. 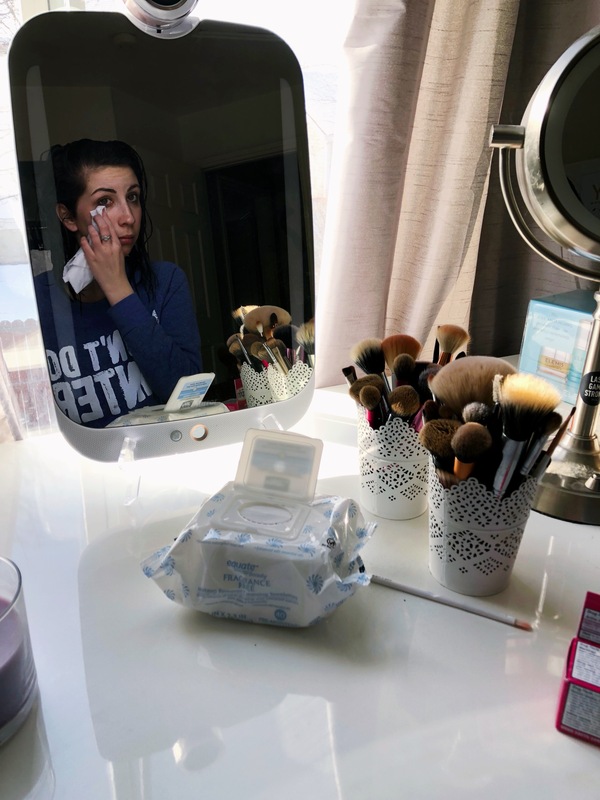 Having these towelettes on hand every morning has helped simplify my makeup routine and sped it up – I’m no longer getting up and down from my vanity to go wash my face or to fix a makeup mistake. I can take care of it all with my Equate Fragrance-Free Makeup Remover Towelettes. I have a lot of makeup brushes and before a couple weeks ago, I just had them all stuffed in 5 mugs. There was no rhyme or reason and all of my favorite eyeshadow brushes would be completely hidden by my big, fluffy powder brushes. I’m not even exaggerating when I say that I would spend up to 5 minutes searching through the mugs for the ONE eyeshadow brush I wanted to use. I knew I needed to come up with a system so that I could quickly find the makeup brushes I needed without dumping them all over my vanity to search for them. I found an adorable desk organizer at a local home decor store a couple weeks ago and knew that it was exactly what I was looking for. I put all of my fluffy powder brushes and blush brushes and foundation brushes in the three slots and kept all of my smaller eyeshadow brushes on one mug. Now, it’s way easier for me to locate the correct brush in under 15 seconds and I can breeze through my makeup in the morning! As someone who constantly gets carried away by her makeup collection and makeup look ideas, I often spent time in the morning looking through my eyeshadow palettes and trying to figure out what look I wanted to create for the day. Once I settled on a palette and had a vision, I would spend a TON of time blending out different colors to make that vision come to life. I had to accept the fact that on M/W/F when I have to be in the office right at 8, I do not have the time nor luxury to experiment with different eyeshadows and looks. I need to save that kind of stuff for the weekend when I have more time! I needed to have a go-to makeup routine that I could easily move through without getting distracted by different ideas or eyeshadows or blushes. I choose one of my favorite neutral palettes and spent a couple days coming up with an easy-to-create eyeshadow look that I could do in 2 minutes flat. At the same time, I still wanted to be trying out new products throughout the week so I could review them and share my thoughts with you guys. That’s the best kind of test, after all: wearing a new product through my 8-hour work-day! I want to equip you with knowledge about makeup so you can walk down a makeup aisle and not feel overwhelmed by all the choices, so trying new makeup out is a must for me. Having the Equate Fragrance Free Makeup Remover Towelettes on hand, an organized makeup brush station, and go-to makeup products already picked out for the week has truly helped me simplify my morning beauty routine without forcing me to sacrifice something I enjoy – putting my makeup on! 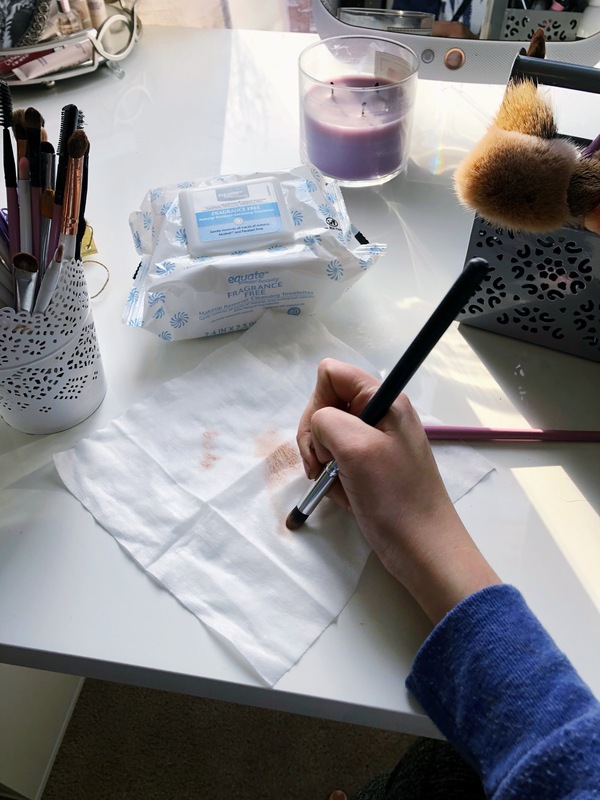 I definitely recommend picking up the Equate wipes on your next Walmart trip and taking a few minutes to organize your brushes and nail down your every-day eyeshadow look – I promise it will simplify your mornings! Do you have any other tips or tricks for simplifying your mornings (general or beauty related?) Have you tried the Equate Makeup Remover Towelettes yet? Let me know in the comments below! P.S. 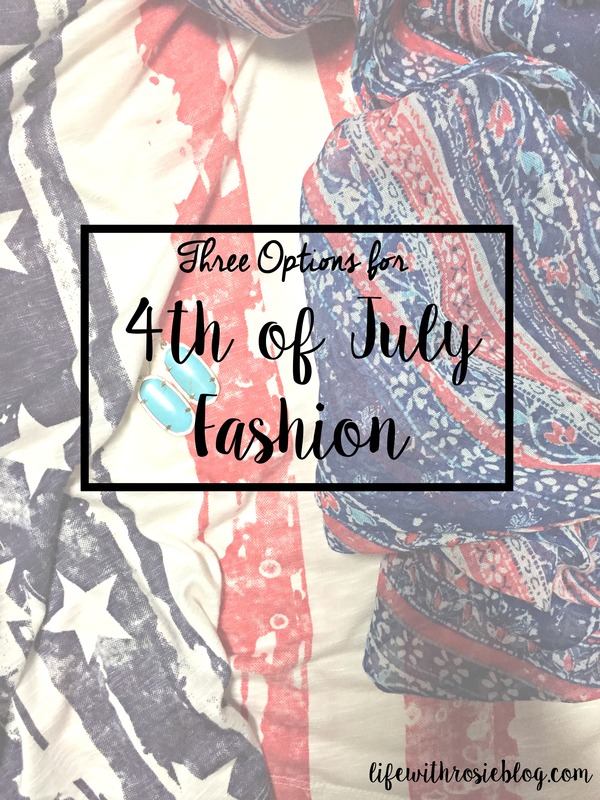 If you found this post helpful, I’d REALLY appreciate it if you could pin it to Pinterest! 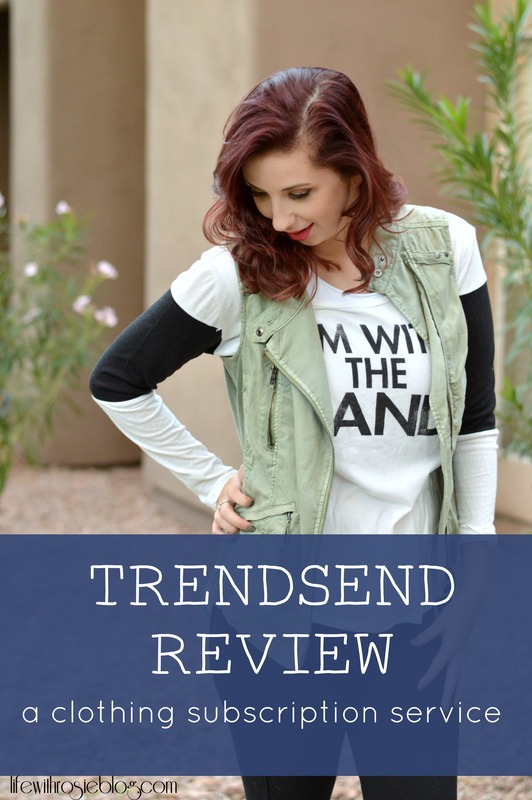 Trendsend Review: Better then Stitchfix?